This is it! For years people have asked if I had boxes for sale and the answer was always no, for the simple reason that my personal workmanship is not very good. Well, at long last, I have found someone who can manfacture these instruments and do it cheaply enough that they can be made available to the public at a reasonable cost. 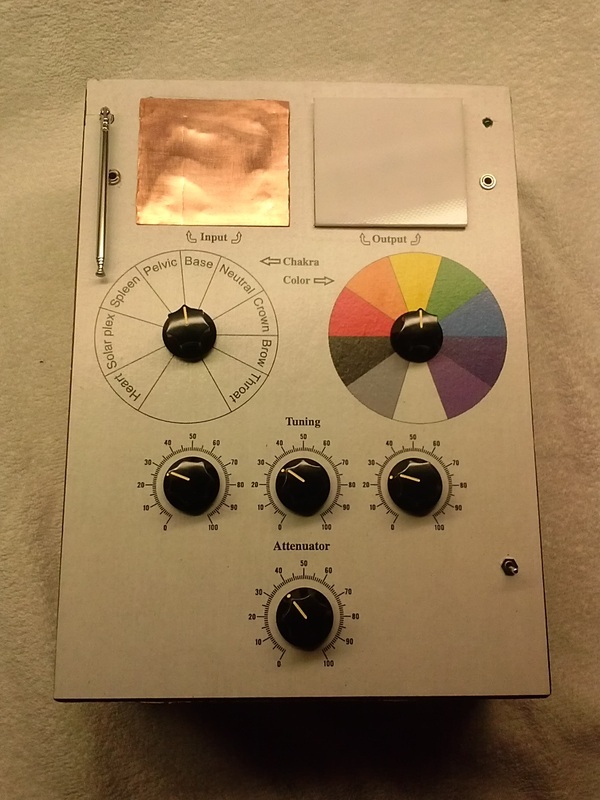 The Cosimano Chakra radionic box is designed to allow the operator to work with the chakras of the target receiver as well as his own if desired. And it is very very easy to use. The witness of the person is placed on the copper plate in the left hand corner. Then you chose the chakra you wish to work with, let us say you want to use his brow chakra to send a telepathic message to. In that case you set the chakra dial to "brow" and the color dial to indigo. Once you have done that you take a rate on the three dials under the large dials. You can do that by either using the stick pad, turning each dial while gently rubbing it until you get a stick, or just turning each dial in turn until if feels right. There is no way you can do this wrong. Once that is done you turn the dial at the base to put the whole thing together and you are done. All you need do now is turn on the amplifier and let it run. How to order? First, put the money into my paypal account under drpsionic@aol.com and then write me either Drpsionic@aol.com or drpsionic@yahoo.com with your shipping address. I will then forward the order to Dr. Mulder who will then build your instrument to order and ship it to you.